Value investing has been preached by various investors such as Warren Buffet, Ben Graham. One of the best large value domestic stock funds is BlackRock Equity Dividend. This BlackRock fund is also rated 4 stars. Please find the following fund's review. 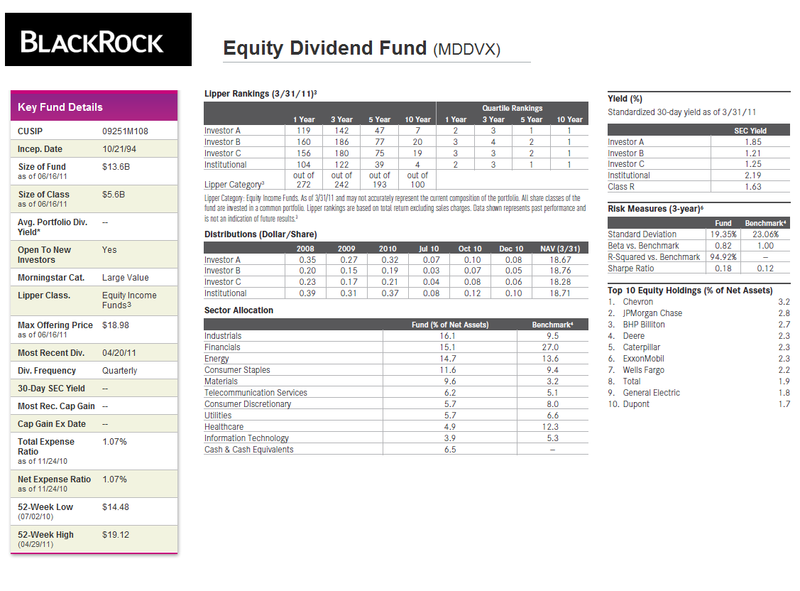 The BlackRock Equity Dividend investment seeks long term total return and current income. This BlackRock fund invests most of assets in a portfolio of equity securities. It typically invests >80% of assets in equity securities and >80% of assets in dividend paying securities. This MDDVX fund may invest in securities of companies with any market capitalization, but will generally focus on large cap securities. It may invest some of total assets (<25%) in securities of foreign issuers. The fund may invest in securities denominated in both U.S. dollars and non-U.S. dollar currencies. It may also invest in convertible bonds and non-convertible preferred stock. Robert M. Shearer has managed this fund since November 2001. The fund inception date was on October 1994. The minimum balance to invest in this fund is $1,000 for brokerage and $100 for IRA account with $50 of minimum subsequent investment. The fund has 1.04% annual expense ratio rate, which is a bit lower compared to the average in the category (1.27%). The management fee is 0.25% and sales load fee is 5.25%. The fund has 1.73% dividend yield. The last dividend was distributed in April 2011. MDDVX has returned 20.60% over the past one year and 5.97% over the past 10 years. During its 13 years of positive return, the highest fund performance was achieved in 1997 with 28.21%. And the lowest return so far was in 2008 with -32.79%. This best stock fund can be purchased from a wide range of 114 brokerages include Vanguard, JP Morgan, TD Ameritrade Inc, Merrill Lynch, Scottrade Load, Edward Jones, Pru Choice Investments, Firstrade, etc. The other classes of this fund are Investor B (MBDVX), Investor C (MCDVX), Class R (MRDVX), Institutional Class (MADVX) and Service Class (MSDVX). Among all, the institutional Class has the lowest expense ratio with 0.80%. As of January 2011, the portfolio composition of this top fund is 79.5% in U.S. Stocks, 20.4% in Non-U.S. Stocks and 0.1% in others. The top 10 holdings out of 116 total holdings for the first quarter of 2011 are Chevron (3.2%), JP Morgan Chase (2.8%), BHP Biliton (2.7%), Deere (2.3%), Catepillar (2.3%), Exxon Mobil (2.3%), Wells Fargo (2.2%), Total (1.9%), General Electric (1.8%) and Dupont (1.7%).